Experience staying in a country style home with your hosts, Tricia & Bruce. Their home offers all the comforts for complete relaxation. 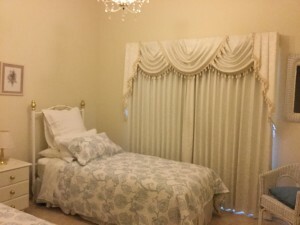 Guests have a choice of two bedrooms inside hosts main house. One offering a Queen size bed, the other being a twin room with shared bathroom facilities. Monogrammed bath robes and towels are placed in each room for guests use. A fully cooked delicious breakfast makes the start for the perfect day. Guests are welcome to join their hosts in a leisurely three course dinner if prior notice is given. A welcoming lounge, sunny verandas with beautiful gardens over looking Lake Boga ensures comfort and tranquillity at its best. A great place to curl up and read a book or why not try the local wines and produce whilst picnicking along the lake foreshore. Look at the beautiful sunsets whilst taking that intimate stroll with your partner. Lake Boga is a paradise for bird lovers and environmentalists (68 species have been noted). 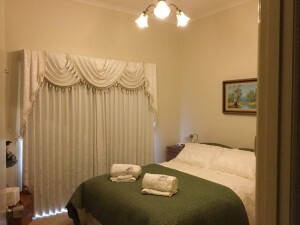 This traditional home style B&B is a home away from home, with an atmosphere where you are made most welcome.